You don’t need to be competing in the IRONMAN triathlon series to benefit from Raynard Tissink’s advice. His guidance will help you to move forward and achieve your own personal fitness goals. Running a marathon on its own can be difficult. Running one after a 3.8km swim and a 180km bike ride is a huge challenge. Your legs feel like jelly and those first few steps off the bike feel like you’re running through quick sand. The IRONMAN® run course is where the race is won or lost. It is where even the fastest, strongest and fittest athletes often fall apart. By now, your training should be complete, and you should be recovering and sharpening up in your taper. If you haven’t put in those long run days, those hill and interval sessions, and most importantly those brick sessions – you are going to be in for a very long day on the 29th March. So, let’s assume your training is on track, and you’re in the shape of your life and planning to run a personal best come race day. You need to remember that no amount of fitness and speed can overcome a poor race execution strategy. The majority of athletes reading this will be novice athletes who have never raced an IRONMAN® before and may have no idea about what to expect. • Ease off in the last few km’s of the bike leg to allow your legs to recover. Change to a smaller gear and spin slightly faster. Also, stand and stretch your back and legs. • Start the run easy. The crowd will be cheering and you’ll be tempted to take off out of transition like you’re running a 100m sprint. Don’t. Be conservative over the first 10km and rather hold back giving your legs time to adjust to the change. • Once you’ve settled into your running rhythm, try to maintain a steady pace. • Incorporate walking through the feed zones. It allows you time to get proper nutrition in, drops your heart rate and allows you time to refocus on the next km. It also breaks the race into shorter stages and the walking at aid stations becomes a reward for the running in-between. • Have your nutrition schedule worked out in advance and try to stick to it. Use Coca Cola in the latter part of the race, as it’s great for giving you a boost. Remember that once you start drinking Coca Cola; continue doing so at all aid stations. • If this is your first IRONMAN®, don’t worry about trying to run a specific time. Rather aim to keep it constant and to maintain good form. Relax your hands, shoulders and neck, use your arms, push off your toes, and control your breathing. 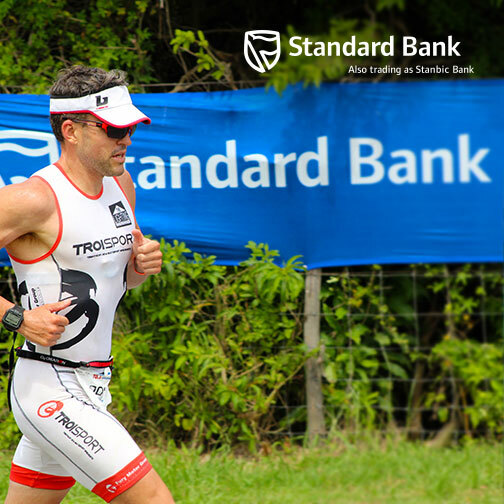 • Taking on an event like Standard Bank IRONMAN® is no small feat. It involves pushing your body to the extreme. You have to be both physically and mentally prepared for whatever gets thrown your way on race day. Expect cramping. Expect to feel completely exhausted. Expect incredibly painful legs. Be prepared to deal with whatever comes your way and see it all as part of the challenge you have taken on. • Remember that most people will go through a bad patch at some point in the day; everyone will be suffering in the last 10km. It’s a long day out there and anything can happen, so take the day as it comes and if problems arise, deal with them, but Never Stop Moving Forward!